The playback of SoundSeeder is asynchronous - soundseeder.com | Play music simultaneously on multiple devices. 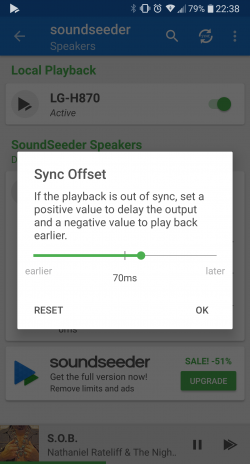 Devices from different manufacturers and with different versions of Android might not be in-sync when you start SoundSeeder for the first time. Therefore you can adjust the offset of your speakers in steps of 10 milliseconds to sync the playback. You can also adjust the offset on Speaker-side, by pressing the +/- button below the rotating album cover. If your connection has become asynchronous while listening to music, press the “SYNC” button to reset the connection. If this happens very often, check the “Auto-sync” preference in the settings of soundseeder. You should also check the Wi-Fi signal strength and traffic load. Using a dedicated portable HotSpot or “Wi-Fi direct” often improves the connection.